(NaturalNews) Belize's famed "Blue Hole" is a magnet for scuba divers and tourists, but it also may now be providing some answers regarding the demise of the Mayan civilization. 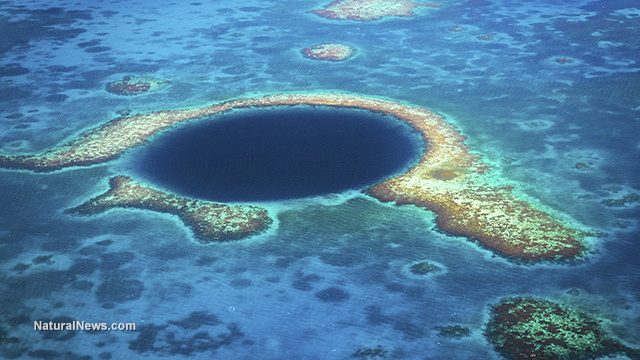 The Blue Hole is an underwater cave which lies at the center of an atoll roughly 40 miles from the Belize shoreline. It's a breathtakingly beautiful natural formation, but scientists have recently found that it also contains evidence supporting the theory that a prolonged drought period brought on the collapse of the Mayan culture. By drilling into the sediment layers of the Blue Hole and a nearby reef, a team of scientists have gathered core samples which suggest that there was a several-century drying period which occurred at the same time that the Mayans abandoned their cities -- roughly 800 A.D. to 1100 A.D. The team of Rice University scientists analyzed the core samples and found evidence that during that three-century period -- particularly from 800 to 900 A.D., and then again from 1000 to 1100 A.D. -- there was little precipitation due to a lack of tropical cyclone activity which normally brings moisture to the region. When the team measured the layers of silt in the samples, they were able to determine which years the region received little rainfall, based on the amount of minerals that were washed into the atoll each rainy season. The theory that drought was the driving factor behind the fall of the Mayans has gained support in recent years, partly due to similar evidence found in the stalactites of a cave in southern Belize, but these new findings appear to prove that the drought was not limited to the area where the cave was located. From the 3rd to 7th century A.D., the Mayans created a highly advanced civilization in the Yucatan peninsula, building the familiar pyramids and developing an understanding of astronomy that still astounds researchers to this day. The Mayans also were responsible for creating a hieroglyphic writing system and the now-infamous calendar which was believed by some to have predicted the end of civilization in 2012. Although our own civilization survived past 2012, the Mayan culture began to fall apart around the period when the droughts began. As Dr. Andre Droxler, an earth scientist at Rice and one of the co-authors of the study put it: "When you have major droughts, you start to get famines and unrest." During the drought periods, the Mayan culture began to descend into warfare and chaos, briefly re-emerging after the first period and disappearing altogether after the second. Even though the end of the Mayan calendar did not lead to the immediate demise of our own civilization, as some feared, there still may be an important warning contained in the results of the recent findings. Regardless of how advanced our modern culture may seem, we are still as dependent on water as ever to survive. And water supplies are dwindling worldwide, partly due to severe droughts -- such as the one currently plaguing California -- but also due to overuse of water resources and pollution. In Brazil, for example, which has more water resources than any other place on the planet, there is a serious dispute between the country's two largest cities -- Rio de Janeiro and Sao Paulo -- over the rights to a water source that is situated between them. And historically speaking, it's not just the Mayan culture which collapsed over a lack of water resources -- it is also theorized that droughts led to the demise of the Assyrian civilization during the 7th century B.C. As water becomes more scarce, we can expect to see more disputes and unrest throughout the modern world, and if we don't pay attention to the history lessons from the Mayans and others, we too may face a serious threat to our very existence within a relatively short amount of time.